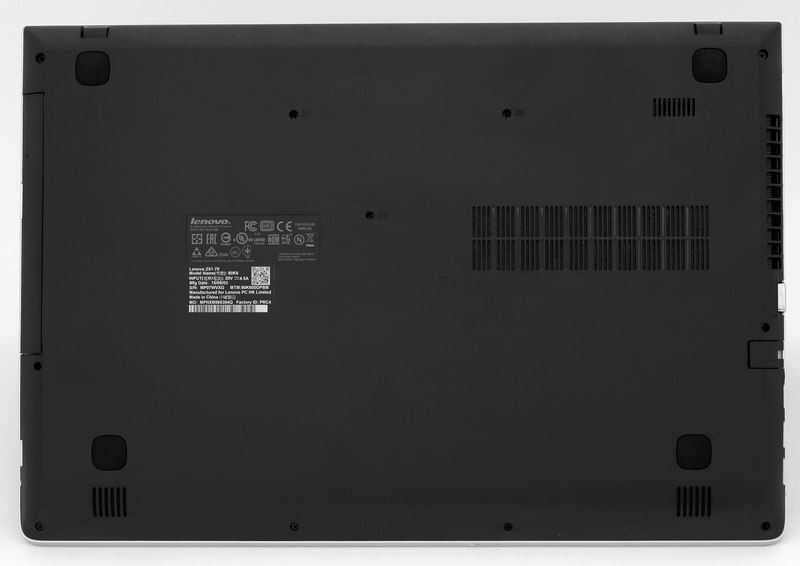 Entry-level multimedia notebooks have one problem – they don’t deliver the much-needed screen quality unless the price of the IPS panels falls in the following years. But that’s really normal for laptops costing around €700. Still there are some exceptions, but it’s hard to find a decent screen for the asking price. On the other hand, the build and the hardware are fairly good and the latter may handle some gaming as well. With the Lenovo Z51-70, you will be expecting just that. The TN panel isn’t astonishing, but the build and hardware are perfectly capable of handling gaming from time to time. The CPU is part of the ULV (ultra-low voltage) line from Intel while the GPU is AMD Radeon R9 M375 – it can take some serious beating and it falls into the higher-mid range class. However, we suspect that the CPU may trip the performance of the GPU. Also, the discrete graphics card has 128-bit DDR3 memory, which appears to be a bottleneck for the GPU clocked at 1015 MHz. Let’s find out if this mid-ranger can take on the competition. You can find all the available configurations at Amazon.com. 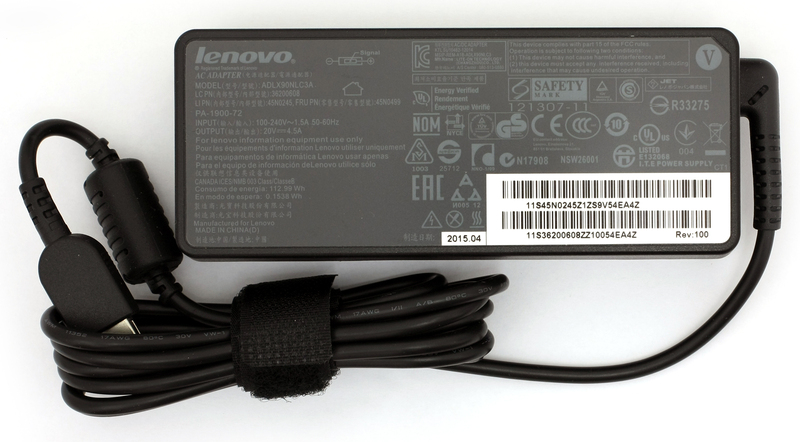 The Lenovo Z51-70 comes in a modest package with the usual drivers, AC adapter, charging cable and the notebook, of course. Of course, you cannot expect some kind of aluminum build or massive construction, but somehow the Z51 doesn’t lack the stiffness. 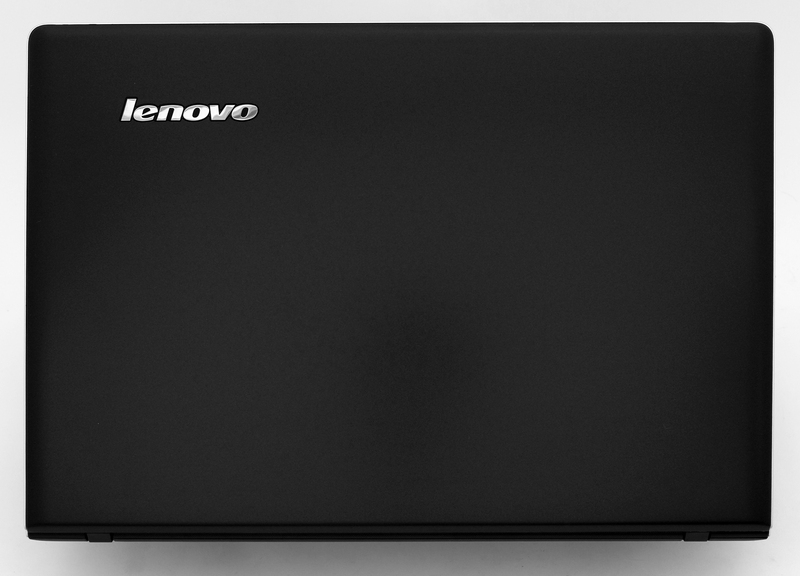 It’s plastic all-around and it’s relatively light – just 2.3 kg and even has advantage over some high-end notebooks. The lid uses mostly glossy plastic but somehow resembles a matte finish. Our version is colored in black and attracts fingerprints and smudges. If you go for the white version, however, this issue might not be present. Also, the lid surprisingly doesn’t bend so much under pressure and that’s a good thing. The bottom piece has a small grill for extra airflow when used with an external cooling pad, for example. The sides are quite thin – 24.6 mm and that’s a rare find in this price range. Anyway, the machine offers the bare minimum of ports with the VGA, HDMI, two USB 3.0 and DC charging port on the left while the right side has only one USB 2.0, 3.5 mm audio jack, optical drive and SD card reader. The main exhaust vent is located on the left so you won’t be bothered with the hot air during heavy load. Interestingly enough, the keyboard doesn’t seem to inherit the stiffness of the aluminum-like plastic that’s around it. Even under the lightest press of a button, the keyboard tray sinks in. 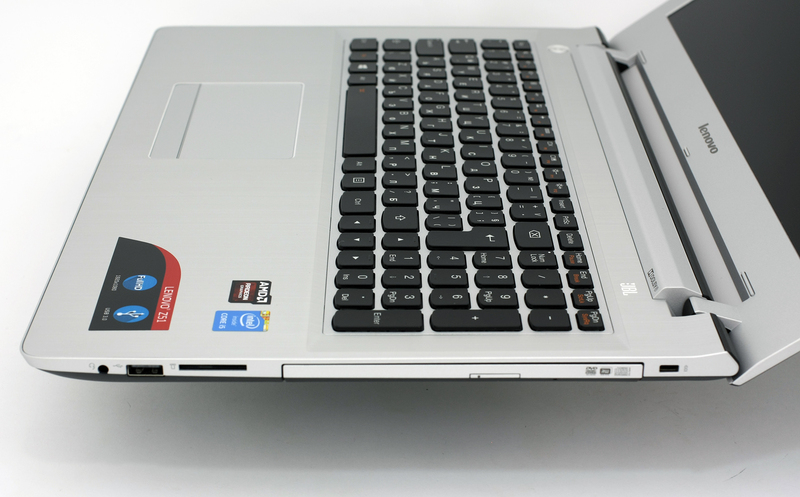 However, this doesn’t ruin the typing experience as the buttons provide long enough key travel and good ergonomics thanks to the AccuType design that we are used to seeing in numerous Lenovo laptops. Luckily, the interior doesn’t attract fingerprints and has that really good feeling of an authentic aluminum. 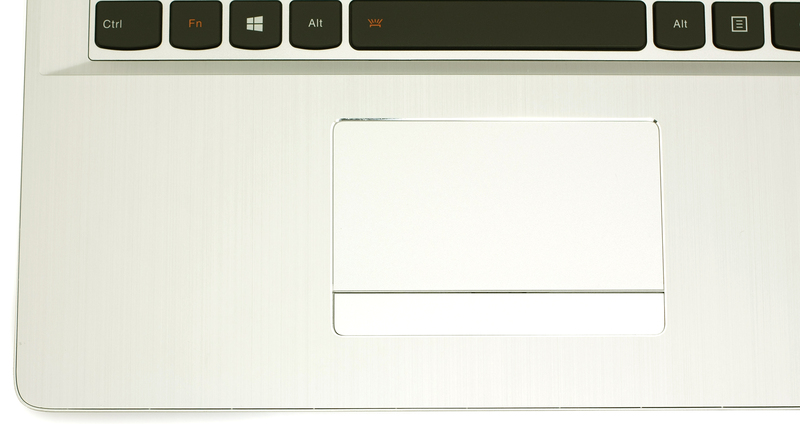 The touchpad consists of the trackpad area and two dedicated mouse buttons under it. It feels okay and the mouse buttons are really comfortable to reach with your thumb, but the default settings of the mouse pointer suggest too fast mouse acceleration. A bit of tweaking will set things right. There’s actually nothing to complain about the notebook’s design. It’s sturdy, it’s light, it’s thin. 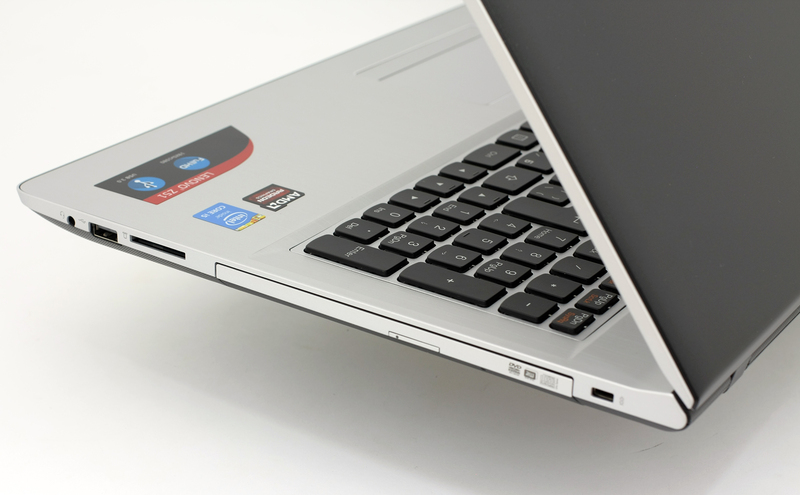 The keyboard and touchpad feel great for an entry-level multimedia system and we would have been even happier if the keyboard tray was a bit stiffer and if the lid wasn’t a fingerprint magnet. 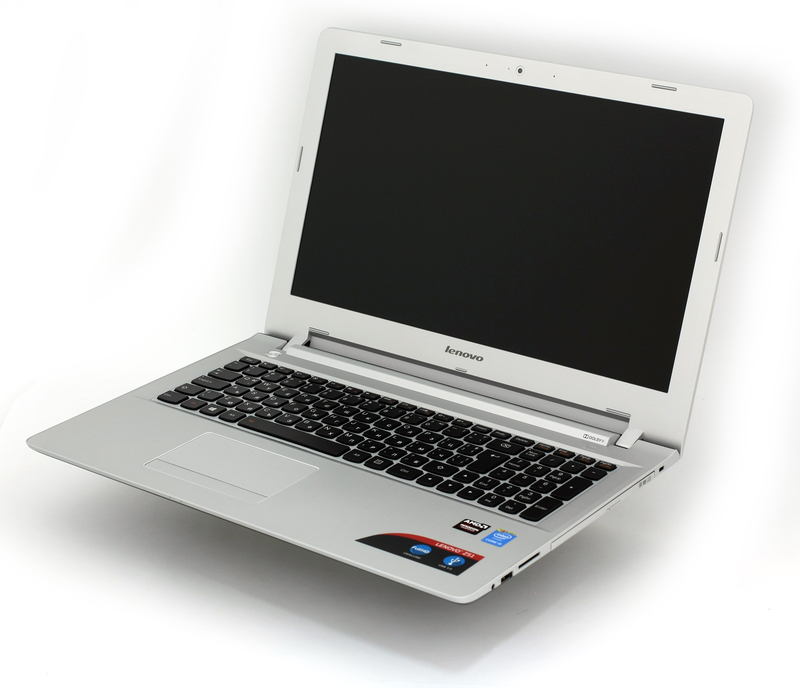 The notebook uses Innolux TN panel with model number N156HGE-EAB, Full HD resolution (1920×1080) and 16:9 aspect ratio. The pixel density is 141 ppi and the pixel density is 0.18 x 0.18 so viewing the screen from 61 cm will be optimal and can be considered “Retina”. Due to the TN panel, viewing angles aren’t the best. We measured 221 cd/m2 maximum screen brightness with only 6% deviation. However, the color temperature (6470K) is really close to optimal 6500K. To make sure we are on the same page let’s have a little introduction into the sRGB and Adobe RGB color gamuts. The CIE 1976 Uniform Chromaticity Diagram represents the spectrum of colors visible to the human eye, thus giving you a better perception of color gamut coverage and color accuracy. Inside the black triangle, you will see the standard color gamut (sRGB), used by millions of people in HDTV and on the Web. As for Adobe RGB, it is used to work with professional cameras and monitors when preparing print. Basically, colors inside the black triangle are used by everyone, and so reproducing them accurately is key in a quality display. The yellow triangle below illustrates the sRGB color gamut coverage of the Z51-70’s display is only 49%. The graph below is the same but with recorded results but the colored circles represent the reference colors, the white circles being the result. You can see the main and additional colors with 100% and 50% saturation inside the sRGB gamut. The gamma curve aligns almost perfectly with the 2.2 standard. We calibrated the display at 140 cd/m2 and 6500K color temperature. We used X-Rite i1Display Pro for calibrating. We tested the display using 24 commonly used sample colors like skin tones, grass, blue sky, orange etc. After profiling, the display had an average DeltaE 2000 deviation of only 1.49, while the contrast was just 360:1 before and 200:1 after calibration. Unsatisfying results even for a TN panel. Here’s another batch of colors we were able to check. 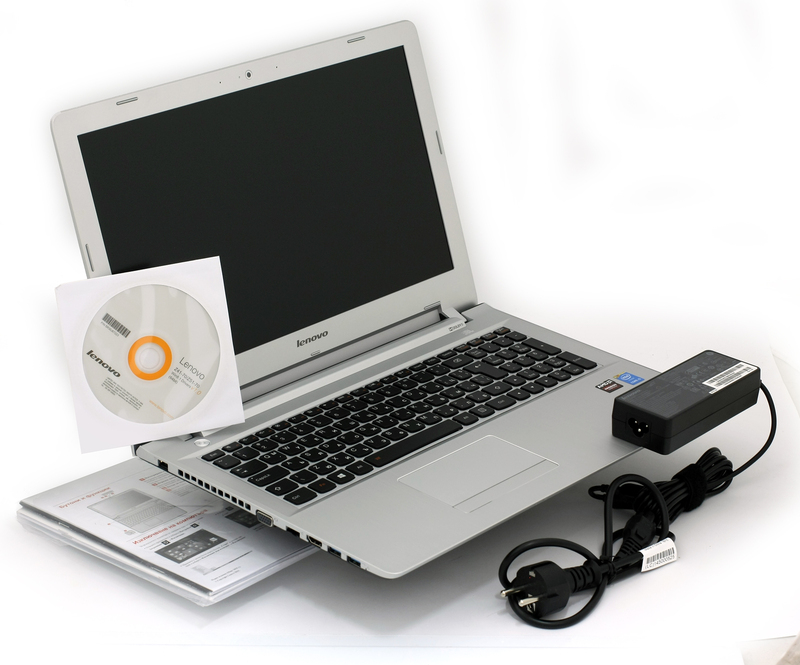 The panel uses PWM only at really low brightness levels – below 60 cd/m2. This is great when you consider the fact that anything under 80 cd/m2 is practically unusable. Even under 60 cd/m2, the panel emits light with really high frequency – 26 kHz and this greatly reduces the negative effect on your eyes. Typically for a mid-range notebook, the display features a TN panel with not so great properties, but even at this price point some of the results are disappointing – 49% sRGB color gamut coverage, and 360:1 contrast ratio. However, we were happy with the default color temperature and the fact that the panel doesn’t use PWM above 60 cd/m2. The JBL-branded loudspeakers provide rich and crisp sound. We observed minor distortions only at lower frequencies (around 300 Hz). Anyway, the sound quality is perfect for multimedia. We used freshly installed Windows 10 (64-bit) for our review. 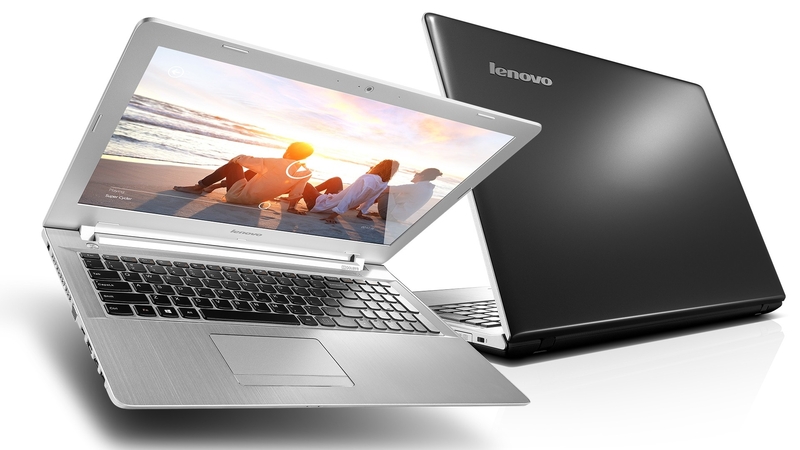 You can download all the needed drivers from Lenovo’s official website: http://support.lenovo.com/bg/bg/products/Laptops-and-netbooks/Lenovo-Z-Series-laptops/z51-70? We can expect decent readings on our test despite the small 41Wh battery – we have ULV CPU on board with not so demanding GPU running the show. Also, the TN panel should prove its energy efficiency in this case. All settings are as follows: Wi-Fi turned on, power saver mode turned on and screen brightness set to 120 cd/m2. In order to simulate real-life conditions, we used our own script to automatically browse through over 70 websites. Pretty average result – 308 minutes (5 hours and 8 minutes). For every test of this kind we use the same video in HD. Slightly lower result here – 296 minutes (4 hours and 56 minutes). The most demanding test was a bit too much for the battery – 87 minutes (1 hour and 27 minutes). 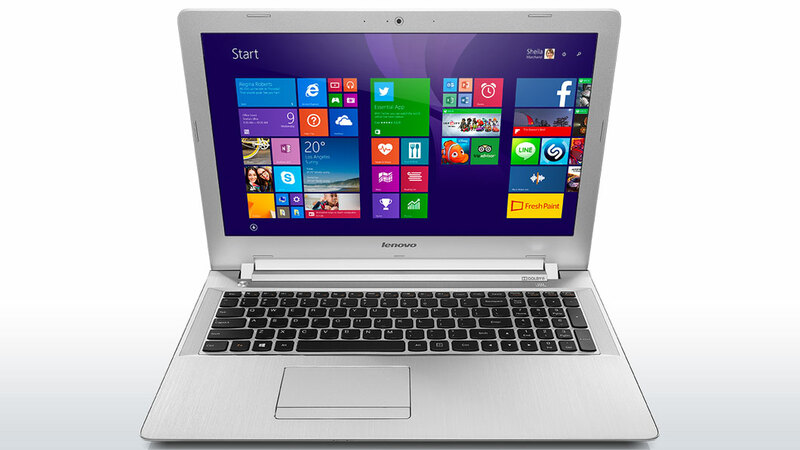 The Intel Core i5-5200U processor is part of the Broadwell family and part of the “U” series CPUs. The “U” series offer a bit lower TDP, in this case 15W, two energy-efficient cores and higher clock rates in order to keep power consumption low without sacrificing the performance. The Core i5-5200U is clocked at 2.2GHz base frequency and can go up to 2.7GHz for one active core and 2.5GHz for one active core, thanks to the Turbo Boost technology. Of course, it’s based on a 64-bit architecture and it’s manufactured by 14nm FinFET process, which means more power, less power consumption in a smaller die size to fit in smaller form factors. It also features the HyperThreading technology from Intel, which means that the CPU emulates one additional virtual core per physical one. The CPU also features Intel HD 5500 integrated GPU with a base frequency of 300MHz and 900MHz Turbo Boost. Other distinctive features are DDR3(L)-1600 Memory Controller with up to 16GB, HyperThreading, AVX, AVX2, Quick Sync, Virtualization, AES-NI, DirectX 11.2 as well as OpenCL 1.3/2.0 support and OpenGL 4.3. 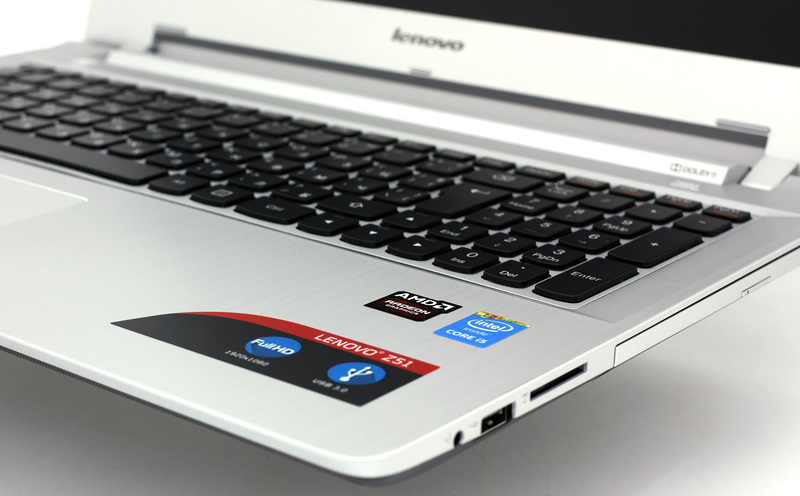 It’s important to add that the i5-5200U has 128KB cache at level 1, 512KB at level 2 and 3072KB at level 3. Fritz is a chess benchmark which tests the computing capabilities of the CPU with various chess moves. 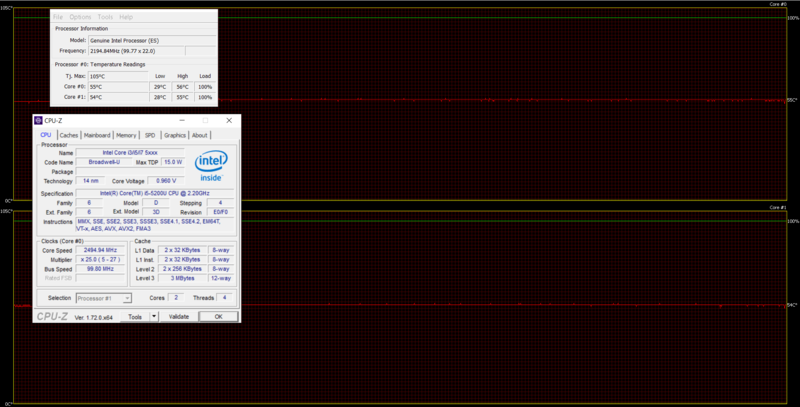 The Intel Core i5-5200U managed to get 5.065 million moves per second. For comparison, one of the most powerful PCs, Deep(er) Blue, was able to squeeze out 200 million moves per second. In 1997 Deep(er) Blue even beat the famous Garry Kasparov with 3.5 to 2.5. 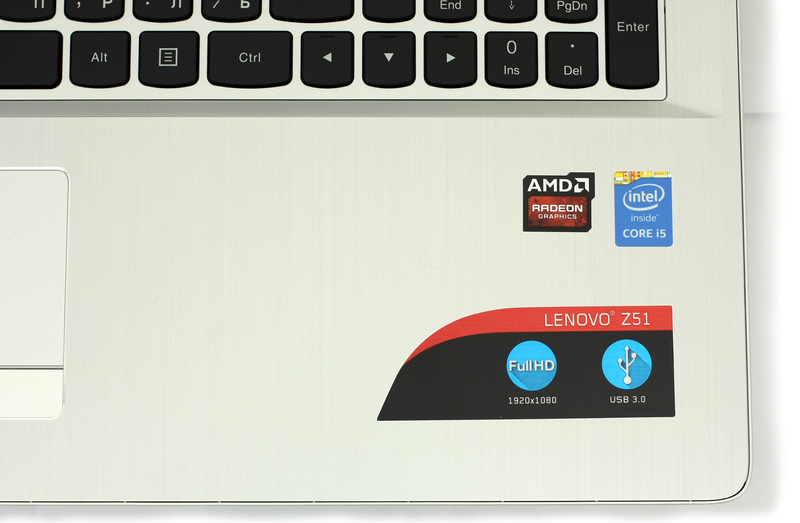 The AMD Radeon R9 M375 is a newly announced mobile GPU outed mid-2015. It’s most probably based on a new chip supporting Vulkan and DirectX 12. Anyway, the GPU is clocked relatively high – 1000 MHz with boost up to 1015 MHz. The GPU integrates 2GB of DDR3 memory with 128-bit bus width. It’s also expected a GDDR5 version to come along in the near future, which would boost the performance by a fair margin. Interestingly, the GPU has quite high power consumption – 75W and the 28 nm manufacturing process is one of the main reasons. AMD Radeon R9 M375 also supports MPEG-4 AVC/H.264, VC-1, MPEG-2, Flash directly by the AMD GPU, Multi-View Codec (MVC), and MPEG-4 part 2 (DivX, xVid) HD. And, of course, the usual features like Enduro or also known as Dynamic Switchable Graphics for preserving energy and Eyefinity for supporting several external displays. In some cases, the CPU appears to be a bottleneck for a smooth gameplay. For example, GTA V runs pretty smoothly in 53 FPS with 768p resolution and settings turned down to minimum. But we experiences annoying stuttering, which was expected especially when the game popped out a dialog box warning us about the CPU not meeting the minimum requirements. So if it wasn’t for the CPU, the GPU was actually able to pull out pretty decent performance. Anyway, as you can see from the image below, games like Tomb Raider can run well even with slightly higher settings. Every notebook that we test goes through our temperature tests. It consists of 100% CPU and 100% GPU load and while this isn’t a good representation of a real-life situation, it’s a good way to assess the cooling capabilities of the notebook and the overall stability of the system. We start off with 100% CPU load for at least an hour. Temperatures were low – around 55 °C and the CPU was ticking at 2.5 GHz, which is the maximum operating frequency for two active cores. You can see on the graph below – the red line represents the temperatures while the green one stands for CPU load. Things took a drastic turn when we switched on the GPU torture test. 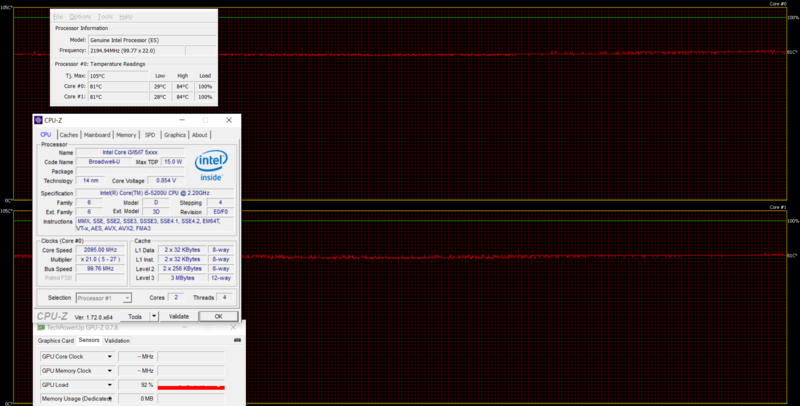 Temperatures rose to 84 °C, the GPU ran smoothly throughout the whole test, but the CPU frequency went down – 2.1 GHz. However, this cannot be considered as major throttling because the base frequency is 2.2 GHz and the intensity and duration of the test are pretty hard on the system. The temperatures on the surface were also low and without any doubt the user experience remains unaffected. The Lenovo Z51-70 tries to balance between a daily driver and a multimedia device, but fails to deliver both in one hit. We are impressed by the build quality and sturdiness of the machine and the input devices are also considerably a big advantage of the device. 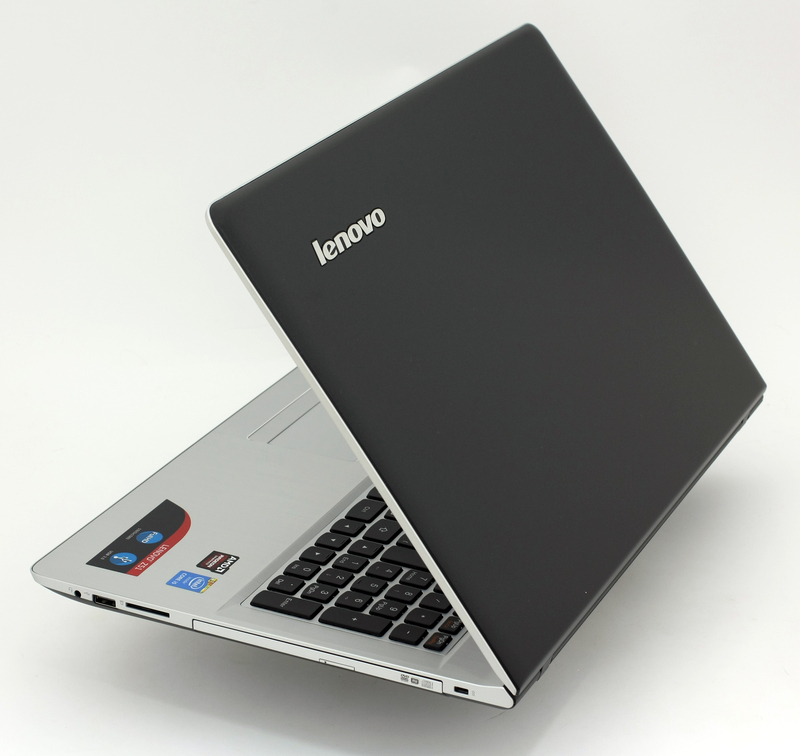 Designers from Lenovo were also able to keep the weight and height low, which is rather impressive given the price point – 2.3 kg and 24.6 mm thick profile. Spec-wise, the notebook doesn’t offer anything too special, but it turns out that the CPU stands as a bottleneck for the GPU in terms of gaming performance. We think that the if the GPU was paired with faster CPU, better gaming performance would be at hand but at the cost of worse battery performance. With this configuration, you will be able to enjoy web browsing and video playback for around 4 hours and more. Anyway, the GPU is perfectly fine for multimedia purposes and so are the JBL-branded stereo loudspeakers. The only thing missing here is better display. Even though this is a budget-friendly notebook, the TN panel delivers unsatisfying image quality – less than half of the sRGB color gamut is covered and the contrast ratio of 360:1 is lower than we are used to seeing even for TN displays. However, the screen uses PWM only below 60 cd/m2 screen brightness and anything under 80 cd/m2 is practically unusable. Even under 60 cd/m2 the screen flickering effect is greatly reduced due to the higher light frequency – 26 kHz.